West Coast Customs is teaming up with Microsoft to build a tech-filled 67 Mustang that will be one exciting ride. The show will air on Discovery Channel’s Velocity this Sunday. The popular TV show, West Coast Customs has been building custom cars for celebrity clients for years. Paris Hilton ordered a custom pink Bentley back in 2008. They built a Mercedes-Benz S550 for Shaquille O’Neil that is the world’s only convertible four-door with suicide doors. Celebrities with tons of money to throw at a car, combined with the ideas of owner Ryan Friedlinghaus, make for one fun custom ride. But what happens when the custom shop teams up with a powerhouse like Microsoft? Well, you get what they are calling “Project Detroit”. As reported by Mustangs Daily, this is going to be one incredible street custom. West Coast Customs is taking a classic 1967 pony car and injecting it with the latest and greatest in-car technology on the planet. If you think Project Detroit is just about taking a 67 Mustang body and putting some of the latest Microsoft gadgets inside, then you haven’t watched the show on Velocity and seen what the team at WCC can do to a car. True Mustang fans will be happy to know that they’ve taken the matt black 1967 fastback Mustang body and mated it to a new 2012 Mustang chassis. After they completed the conversion process of joining the two generations together, the whole car was filled with Microsoft's latest technology. Mustang Daily says the custom Stang was created “to inspire developers to think about building apps and automotive technologies of the future”. If this is what the automotive future looks like, it’s going to one fun ride indeed. Take a look at the list of technologies this new car gets. Project Detroit features an Xbox 360 with Kinect, a Windows operating system, Windows Phone, Windows Azure, Bing, Ford Sync and it doesn’t stop there. It also features a Viper SmartStart app, which can be used to remotely start the car via the Windows Phone. And then to top off the project, a touch-screen is used to control all the fun features, including a passenger dash-mounted tablet PC to surf the internet, or display a message on the rear glass for other cars to see. Now that one alone could cause aggressive drivers some real road rage problems. It’s good to see a small business owner have the success that Ryan Friedlinghaus has experienced. He started the small custom shop on a loan from his grandfather back in 1993. The custom shop has grown to be one of the most popular shows on the Discovery Channel. They are even offering franchise opportunities for the WCC name around the world. The Project Detroit episode airs this Sunday, March 25 at 9 PM Eastern on the Discovery Channel's Velocity. This is one show you don’t want to miss. 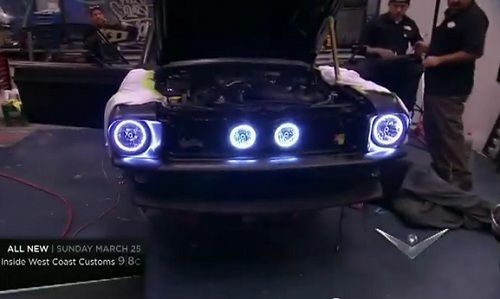 Image source: A screenshot from West Coast Customs promotional video.